The CS-RE-1 Streams Room expander is a CobraNet-enabled preamplifier that is a compact and affordable solution for incorporating additional rooms into the ClareHome Audio Distribution solution. Note: Models herein and their appearance are subject to change without any prior notice. WARNING: Please read all instructions before attempting to install equipment. Failure to follow directions may cause bodily injury and damage to equipment. Remove and inventory all contents from the CS-RE-1 packaging. You must install the CS-RE-1Streams device on a separate CobraNet dedicated audio network and not on the home data network. The data transmission on the network causes the devices to communicate frequently, and there will be no latency on a dedicated audio network. The CS-RE-1 device does not support PoE. You must connect a power supply unit to the device. 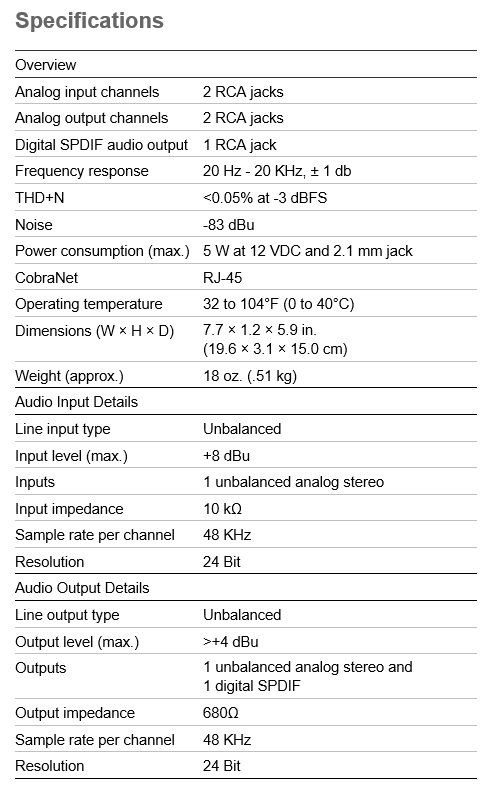 You can use analog output or the SPDIF digital output. 2. Connect the associated output device (OUT 1) to the output connection on the CS-RE-1. If you have a digital connection, connect it to the digital audio output SPDIF port. Note: The output device (OUT 1) port and the SPDIF port cannot be used at the same time. 3. Connect an RJ-45 (Ethernet) network cable to the RJ-45 CobraNet port and the other end to your CobraNet network. 4. Connect the power supply to the power port on the CS-RE-1. The purpose of this worksheet is to provide a place to record important information that you must give to your system programmer. 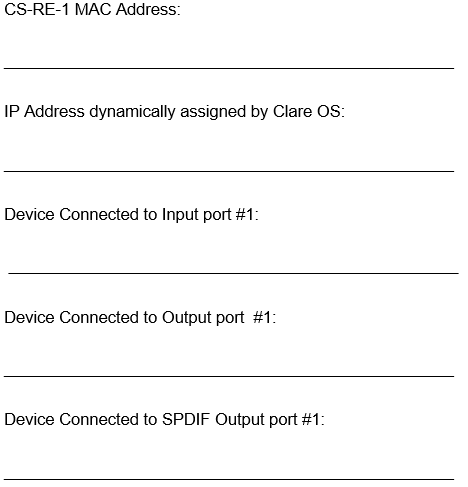 Your system programmer requires the following information to configure this ClareHome Streams device. Clare Controls offers a three (3) year limited warranty on original Clare Controls components, from the date of shipment from Clare Controls. To view complete limited warranty details, including limitations and exclusions, www.clarecontrols.com/warranty.